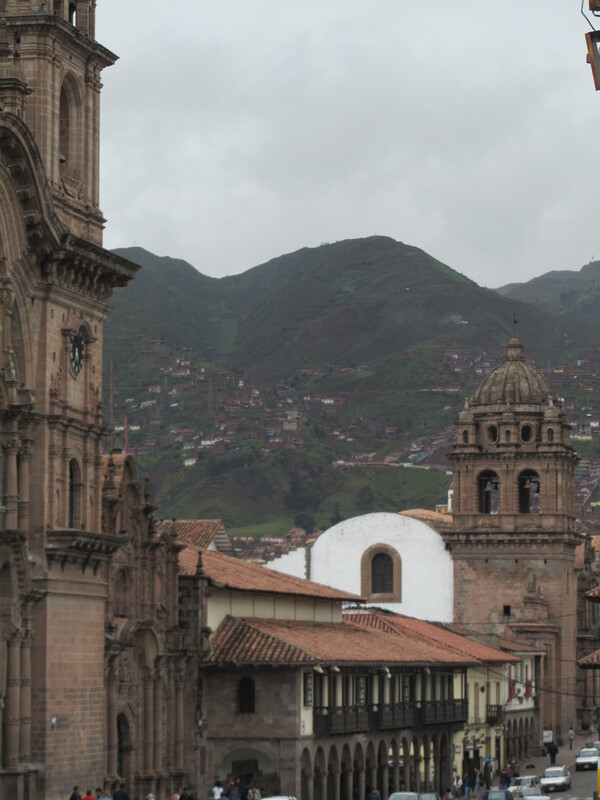 I really can’t even find the words to explain, express, give life to the two weeks I spent in Cusco (the navel of the Incan empire) and the surrounding area. Just one piece of advice to all of you reading this: you gotta go there. 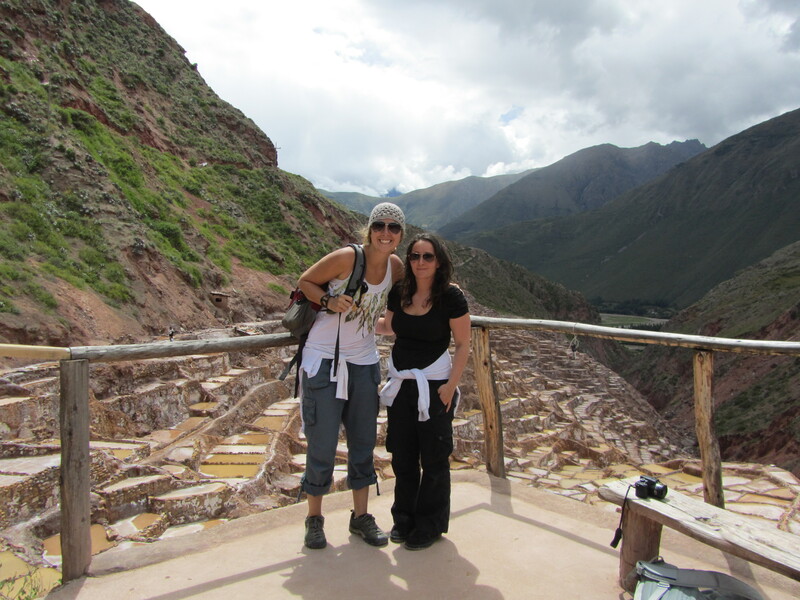 On the plane to Cusco I met an amazing traveling soul, Nickola (a Scottish chef), and we spent the next 3 days jam- packed-tourist-style. 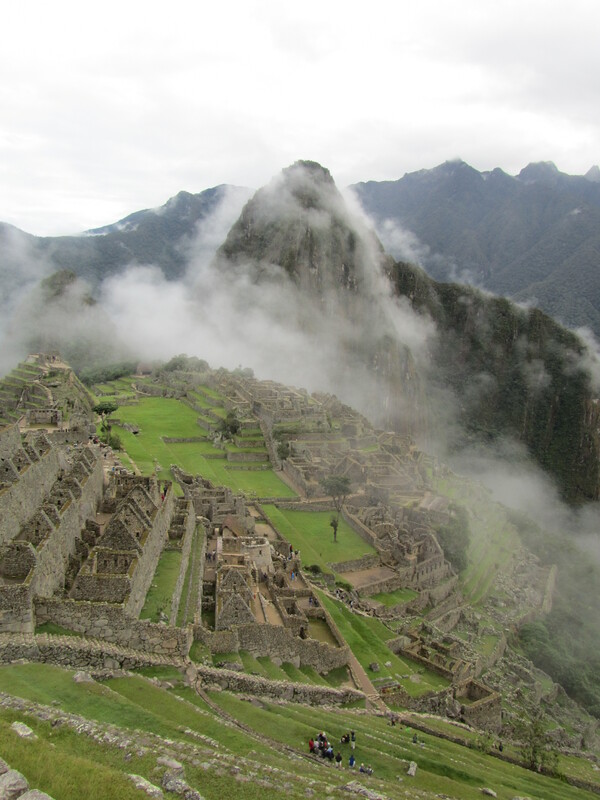 We started to learn about the amazing Incan culture– their expertise in agriculture engineering, and astronomy, their commitment to religion, their ingenuity. We started to ask the questions millions of tourists ask every year that visit this area: How the heck did they move those huge rocks (some of them several hundreds of tons several kilometers, up mountains, across rivers)? No cement.. really? Are you sure these buildings are REALLY earthquake-proof? Over 800 types of corn and over 2000 species of potatoes…. isn’t that a bit of an exaggeration? etc. etc. 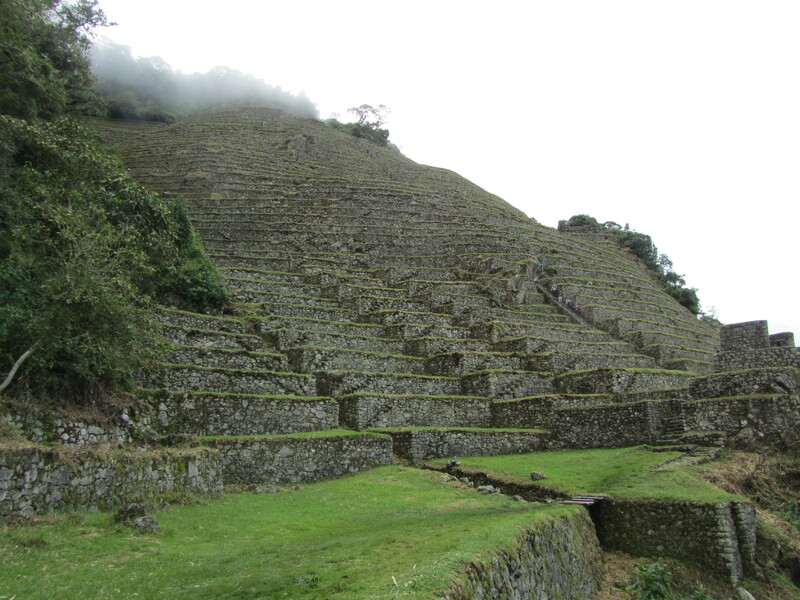 We also were impressed with the amazing culture that remains. There are still many indigenous people living in the area, living off the land, sustaining a modernized version of this ancient culture. 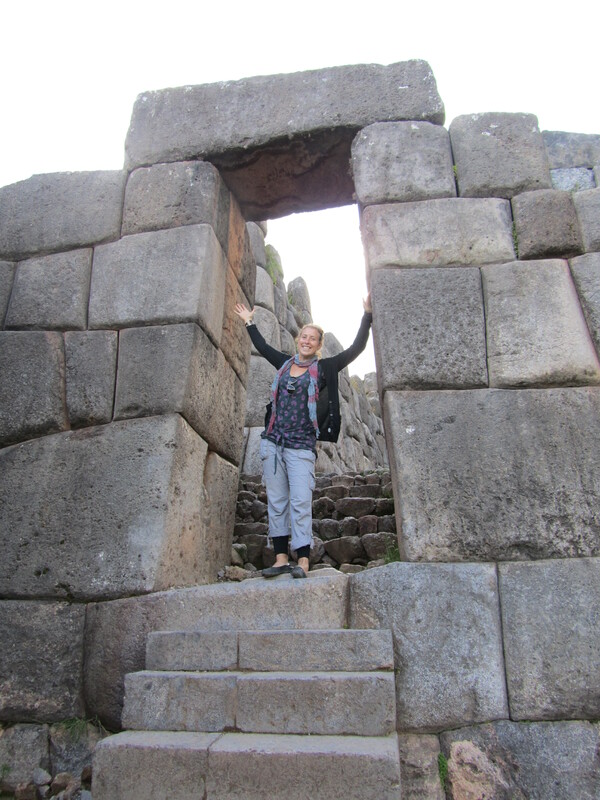 As two single (and apparently rigid, cold and closed-off) women… after a tour of Saqsayhuaman (the Incan ruin located closest to Cusco) our Shamen tour guide informed us that he wanted to “open our hearts”. Yes ladies and gentlemen, my heart has officially been opened– I will let you know how that works out for me. There are LOTS of locals who hit you up for cute little pictures like this... day 1 I could not pass it up. 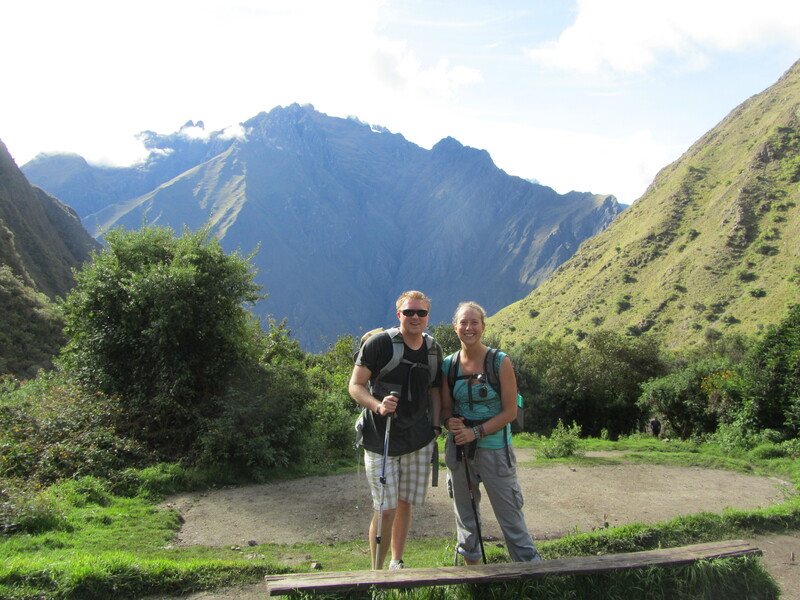 My best friend from Arkansas, Garett, met me later that week to take off on the Inca Trail. 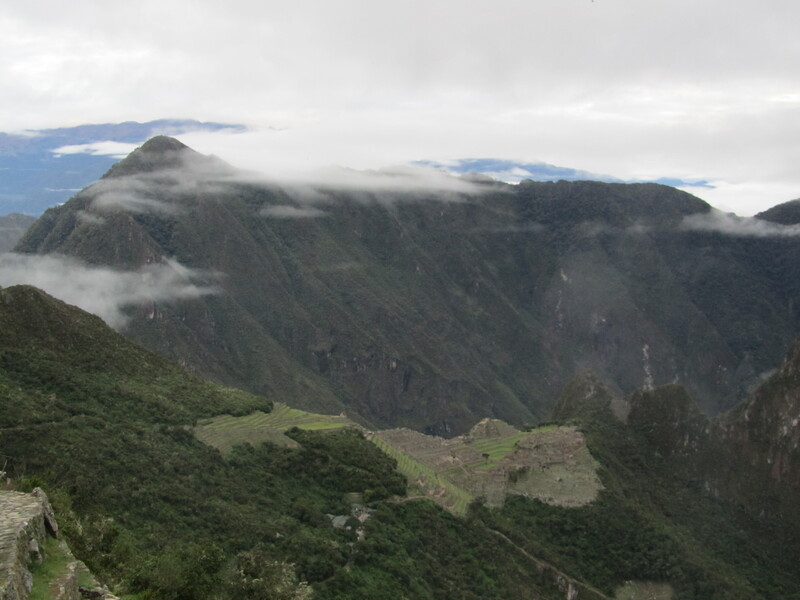 This would be a four-day adventure, about 26 miles, the highest point we reached was 4200m. 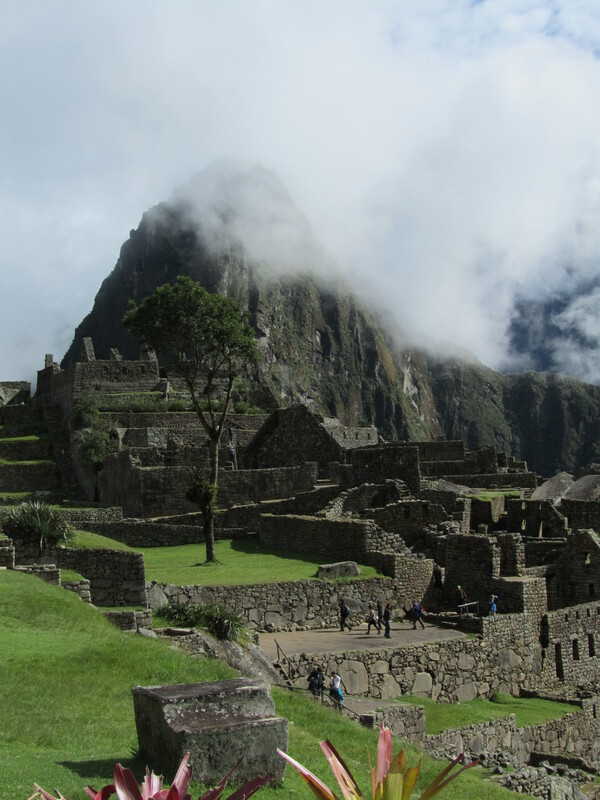 The ending point– Machu Picchu. Preparation the days before included some warm gear shopping (it was a lot cooler here that it has been other locations during my trip), head-lamp buying (we would after all be hiking pre-dawn), rain gear (thank god we bought those ponchos… more on that later), some snacks, a stolen roll of toilet paper from each bathroom in the hotel and we were pretty much ready to go! We left the hotel at around 5:30 and took a bus to km 82 where the fun began. 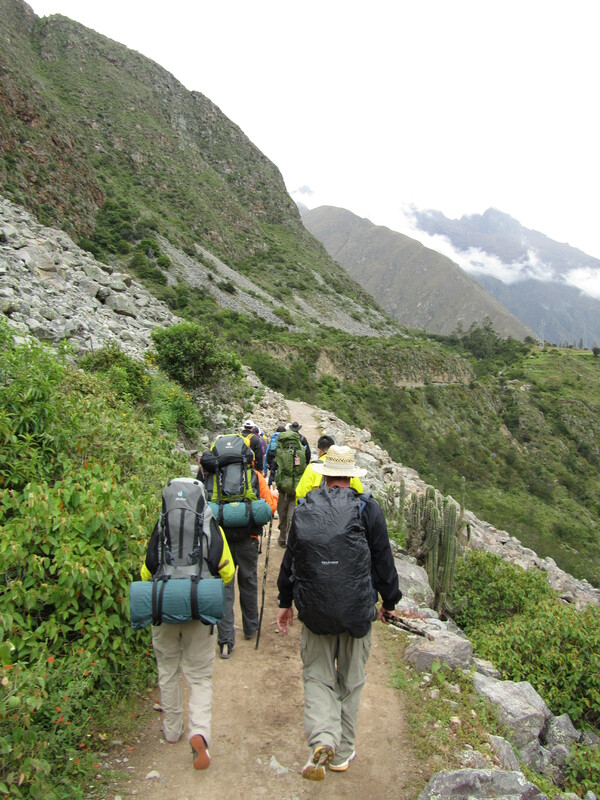 The first day is forecasted to be the “Easy warm-up day” It really was not bad at all… we learned the new term “Inca flat” which is to say nothing along this Andean trail is flat… but the rolling hill areas are as close as it gets and are thus lovingly referred to as Inca flat. It was also on this day that our hilarious and incredibly sarcastic guide David informed us that we should speed up to get to lunch to have our Pizza and Ice cream. We all believed him– yeah, I know it seems stupid as I write it now too… but at the time it seemed well, realistic, likely… obviously true even. We reached camp and did not have Pizza nor icecream. But we did have a team name: our group of 15 ragamuffins between the ages of 18 and 42 would from here forth be called Pizza andIce cream. We also learned the amazing strength of the Chaski. 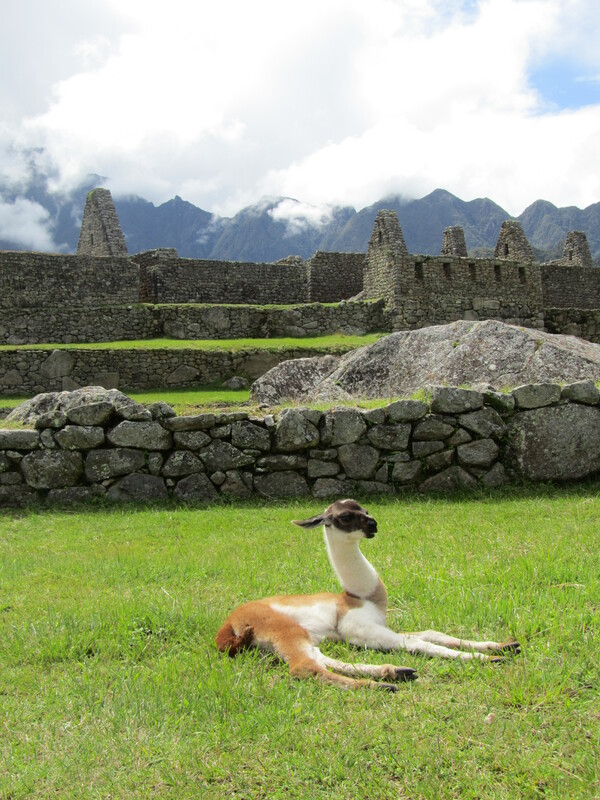 In Incan times, they were the messengers that allowed communication from Cusco to Macchu Pichu or Urubamamba or any other ofthe many Incan cities and towns spread throughout Peru, Ecuador and Colombia at the time. 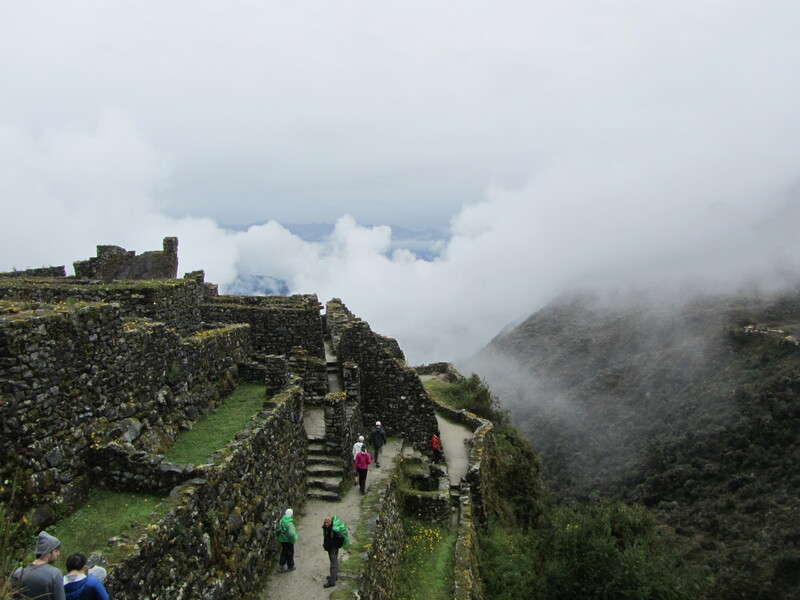 The would literally run in a relay type fasion and could do the entire Inca trail (which we did in 4 days) in like 2 1/2 hours or something amazing like that. 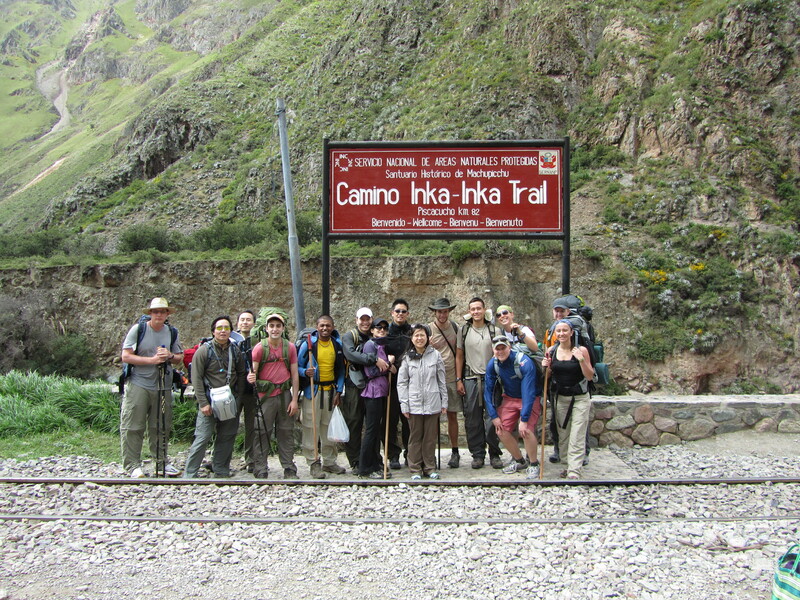 Now, Chaskis are the amazing, the strong, the brave, porters that accompany all of us lazy foreigners on this journey. 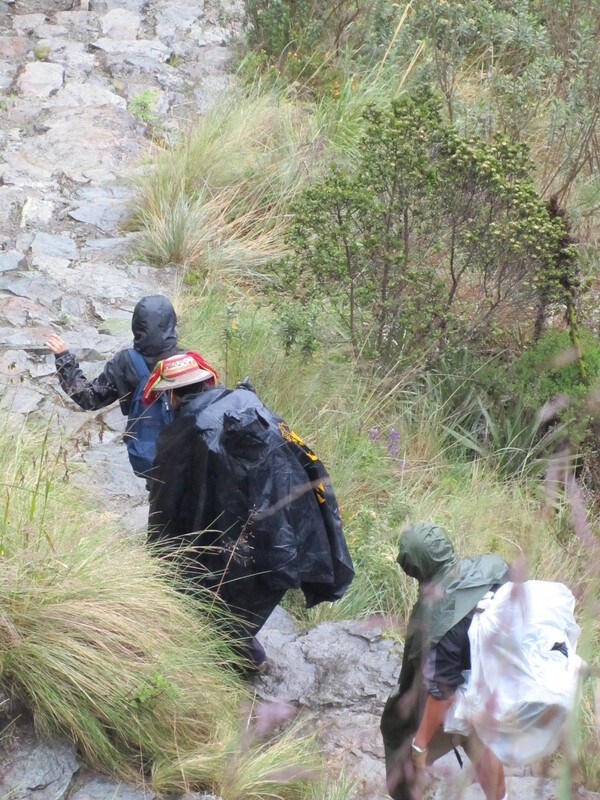 These men carry huge packs (sometimes look like twice the size of the dude himself) and what do they do… leisurely walk behind the tourist crew? Wrong. They basically sprint ahead to battle the other groups for the best campground, cook lunch/dinner/second breakfast/first breakfast what have you. It is amazing. Oh, and then I forgot to tell you this part. After all that… they clap when we get to camp. They “clap us in” and congratulated us every time for, well, surviving I guess. Amazing guys. It was a day of learning really. 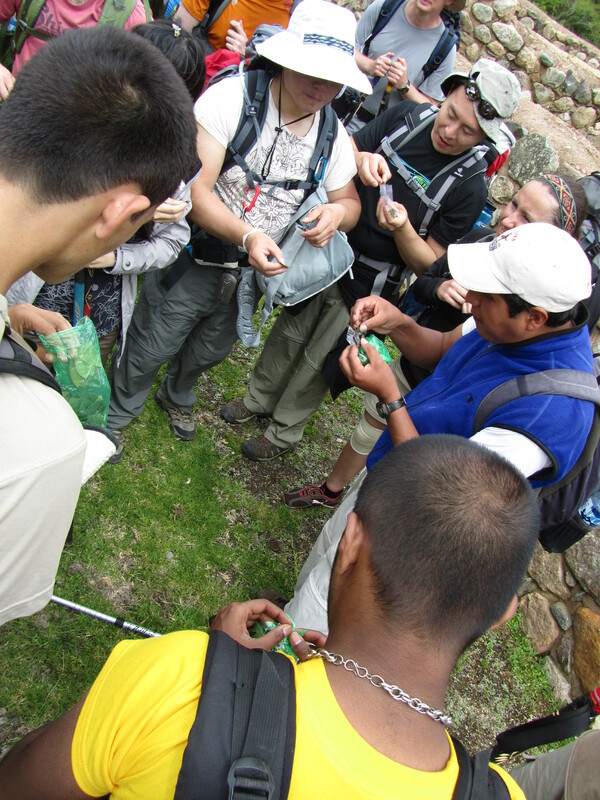 On this day we also learned the art of chewing the coca leaf. 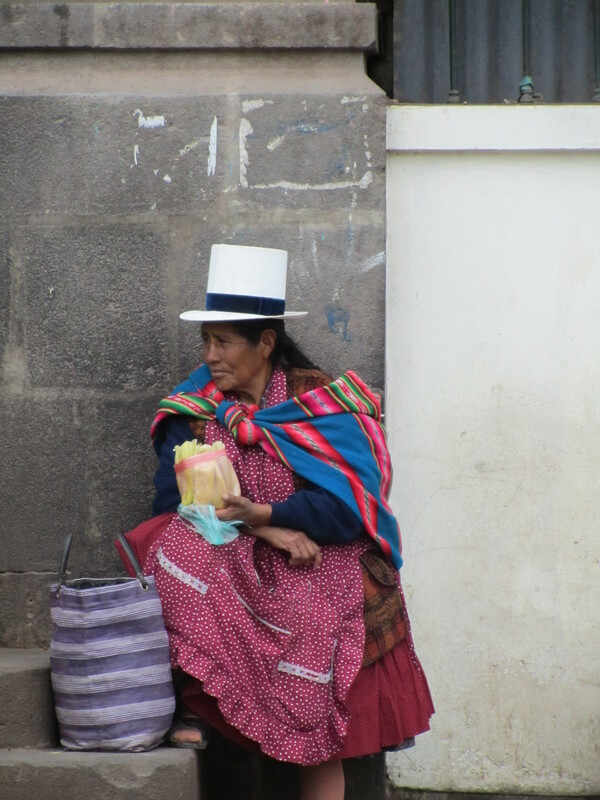 Yes, coca leaves are a huge part of the culture here as it is said to help with the altitude. 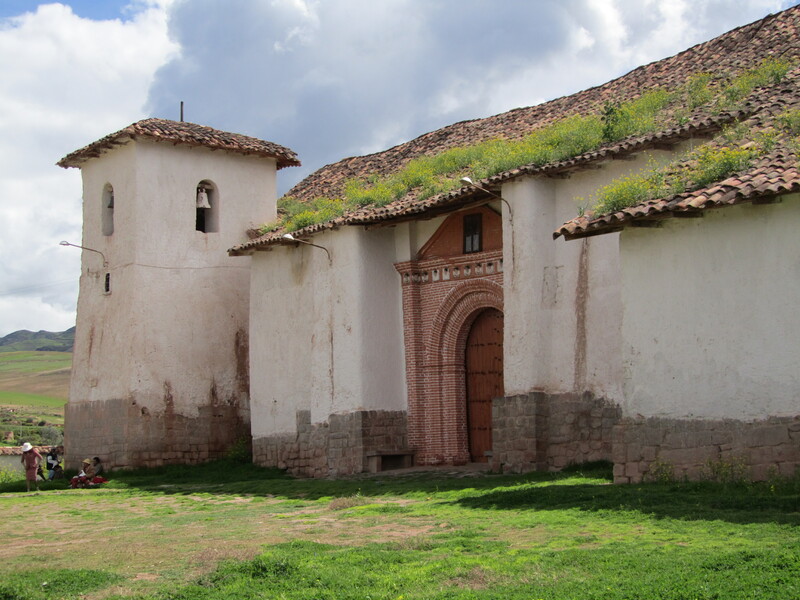 Thus visitors like us are given copious amounts of mate de coca (coca tea) and even are taught how to chew the leaves (best when done with this black charcoal stuff that acts as a catalyst and makes your mouth…. and if you are really lucky, pretty much your whole face, numb). There was lots of coca-ness along this trip. We went 12k this first day and ended at a beautiful camp overlooking a valley. It was perfect hiking weather all day, a little cloudy and cool. Perfect day 1. 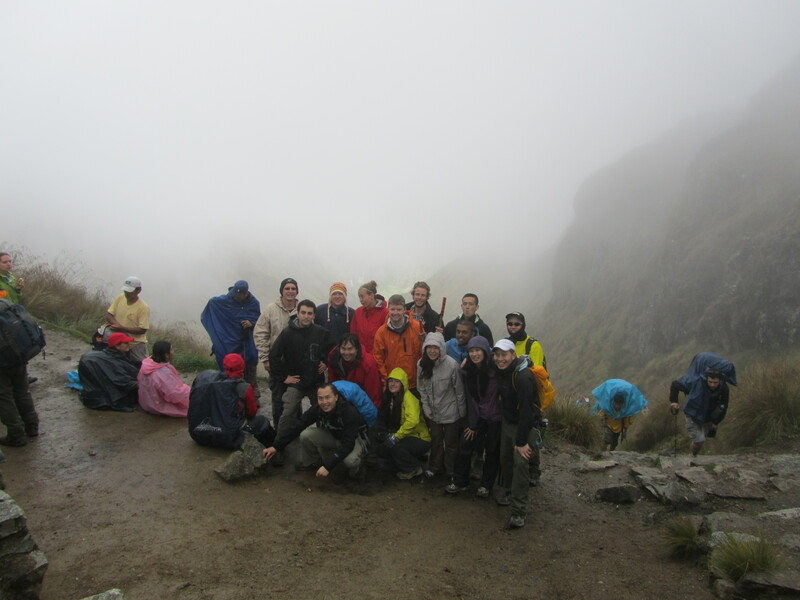 Day 2: This day we climbed to the highest point in the pass which was about 4200m. It started out beautiful. And stayed that way sunny… I even had shorts on. We stopped for our second breakfast (yeah, you read this right… it is pretty much Gucci camping) and then we continued the climb. At which point the rain began. And continued. It rained all through later afternoon (so I am told… I took a long nap!). It stopped for about an hour in the evening after we reached camp. And then it rained all evening and all night and was even still raining in the morning when we started off the next day. So that day (and quite a bit of the next day) we saw lots and lots of clouds. Imagined that there were beautiful mountains behind them… every now and then it would open up. But until the late morning/afternoon of day 3 we didn’t see a whole lot. 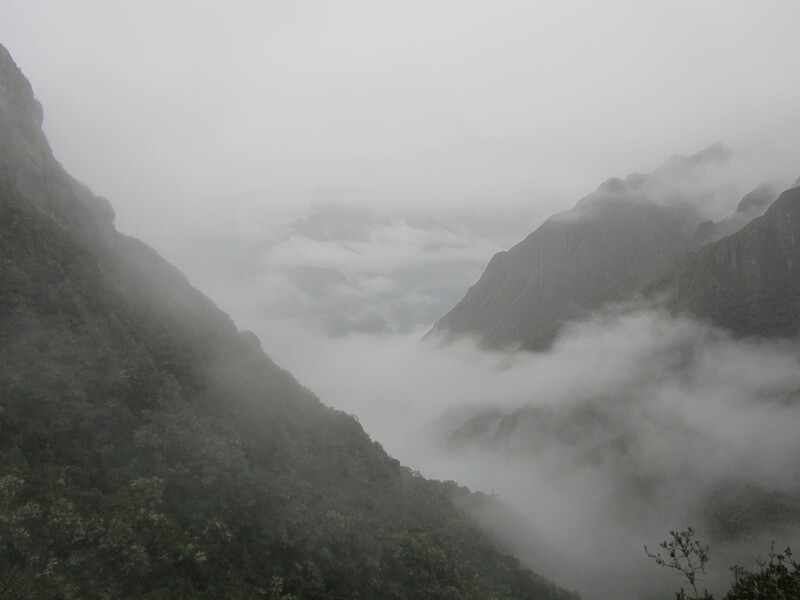 By afternoon it had stopped raining and we stopped at several Inca sights along the way that were absolutely stunning!! That evening we got to the campground and even had a very very welcome warm shower. 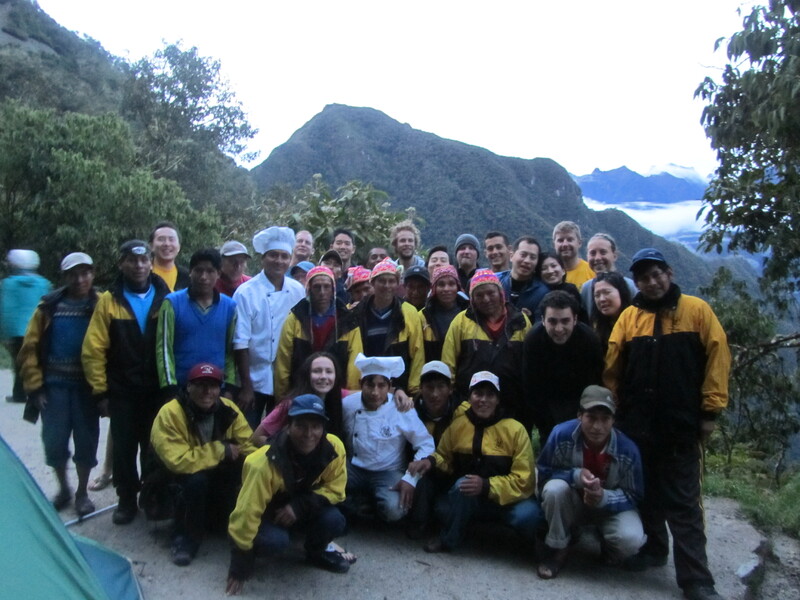 We had a goodbye/thank you dinner– sang the Chaskis and cook a little song (lets just say it went something like this: Macho macho Chaski… yo quiero ser un macho Chaski) took and group picture (see below) and then off to bed. We would have an early morning ahead of us. The day began at 3:40 am when we got our wake-up tap on our tent. We fiddled in the dark to get dressed and stumbled to have a very quick breakfast. It is a race this morning for two reasons 1)you want to be one of the first groups there to have a good position at the Sun Gate, the first view of Machu Picchu 2) the Chaskis have to catch a 5:00am train– this means all of camp has to get broken down and they have to run almost 2 miles in about an hour. I have never seen that kind of efficiency. I think that by the time I walked (stumbled… I don’t wake up well) to the breakfast tent, I looked over my shoulder and our tent was already in a bag and on a chaski’s backpack. I could get used to this type of camping! We waited at the entrance gate until it opened at 5:30 and it literally was a mad dash. We race-hiked for a little over an hour. 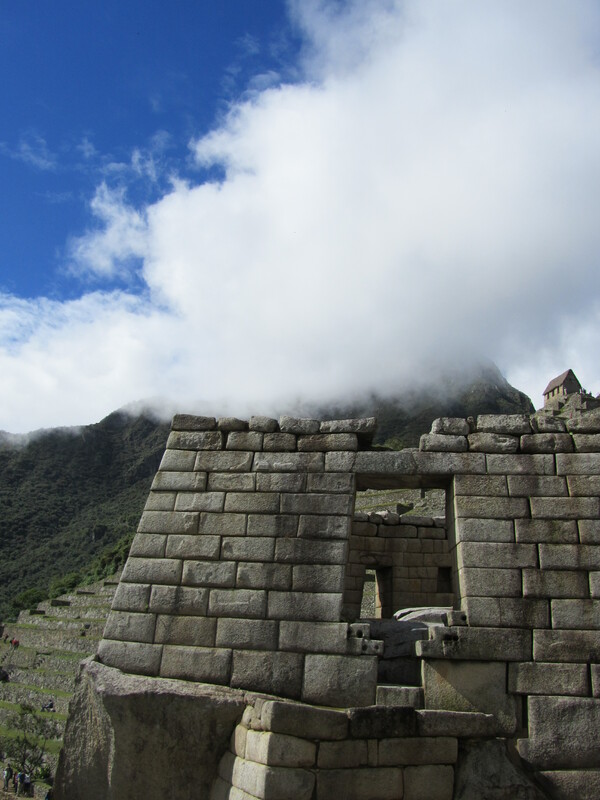 Somehow our group rallied from being third in line to enter, to being the first to get to the Sun Gate. It was amazing. The fog was lifting and there it was… still small but huge at the same time. We were sweaty and exhausted. But it was awesome!! It was so awesome. A little harder than expected. But absolutely worth it. OH MY GOSH. It looks like a fantasy. 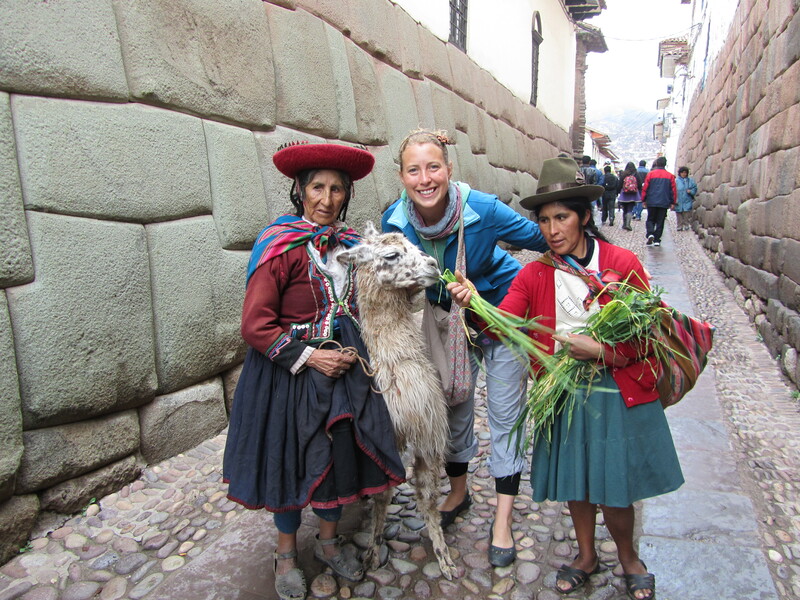 Dead woman’s pass and gringo killer….do you think this ole lady could do this part or should I take the train when I go? It is really so amazing to think all of that is there and most of us have never seen it. I want to go soon. Keely, I am constantly mind-blown/jealous of your effortless coolness. I kind of wish Peru would have deported you, too. But there’s always next time.